There are many safe and cost effective ways to decorate this Halloween. Prepare for this upcoming Halloween by decorating the outside of your home with a wide assortment of scary critters, pumpkins, gourds, and other items that are fall seasonal colors. All it takes is a little creativity and the right supplies to create the perfect Halloween scene that will get everyone into the holiday spirit. One cheap and easy way to decorate this Halloween is to use pumpkins and gourds. These can be grown yourself or bought locally. Pumpkins and gourds are cheap and a classic Halloween decorating tool. Use the classic jack-o’-lantern look or display different sizes of pumpkins and gourds in clusters. Even though pumpkins tend to rot over time, they are less expensive and don’t take up space the rest of the year. Jack-o’-lanterns are also great to create with friends and family. Gourds are often used to make garlands. Garlands are decorative wreaths or cords used during festive occasions. During Halloween they are used to add color to your home and to be hung around various objects. To make a garland out of gourds, you will need to start by selecting several healthy miniature gourds. Drill a small hole through the center of each gourd, and using a needle, thread a piece of twine through the holes. Finally, tie a knot outside each hole to keep the gourds in place. When finished, hang the garland using nails, hooks, or tacks. Another safe and cost effective way to decorate for Halloween is to make wreaths that will represent the scariest time of year. You can do this by using a variety of Halloween or autumn themed supplies. Spray paint silk foliage black and using a hot glue gun, attach Halloween or autumn themed items such as leaves, plastic bats, skulls, vampire teeth, and small pumpkins. You can also use orange and black ornaments for an added Halloween effect. Finish your spooky wreath with a bow made out of black and orange ribbon. One final way to decorate this Halloween is to build a coffin. Use your imagination and creativity to build a simple coffin out of pieces of wood, and place a homemade dummy inside. The more creepy or rickety it is the better! Coffins are great to customize with fake limbs, blood, and paint to add gruesome effect. 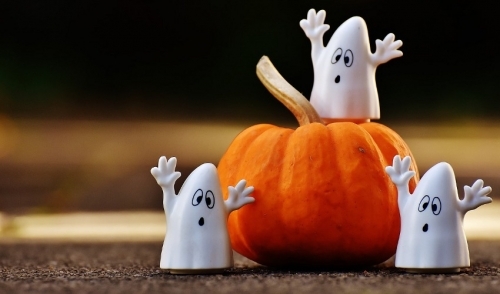 With these safe and cost effective ways to decorate this Halloween, everyone can enjoy the scary holiday without being scared of the costs!